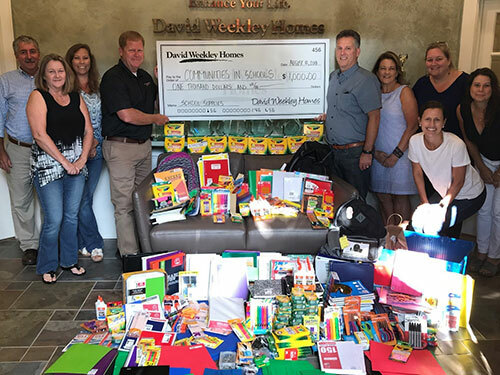 Charleston, SC (August 22, 2018): David Weekley Homes, the nation’s largest privately-held builder, hosted its fourth annual, companywide CA+RE School Supplies Drive in 17 cities across the country. In Charleston, school supplies were collected for Communities in Schools, an organization committed to helping children achieve success through continued education. The organization provides tutoring, mentoring and various student support programs to nearly 10,000 students in 19 Charleston and Berkeley County schools. “Our staff works so hard and they give so much of themselves it really keeps them motivated to feel the support from partners like David Weekley Homes,” said Kristin Power, development director for Communities in Schools. Approximately $4,000 in supplies were collected from homeowners, vendors, Real Estate Agents and business partners during the drive. This donation provided 400 students with the supplies needed for the school year. In addition, the organization received a $1,000 grant from The David Weekley Family Foundation. The School Supplies Drive is a volunteer and philanthropic initiative of the company’s CARE program, which joins team members with homeowners, homebuyers, community partners and local nonprofit organizations to live out its purpose of Building Dreams, Enhancing Lives in each of the communities in which it builds. David Weekley Team Members donated school supplies to Communities in Schools.